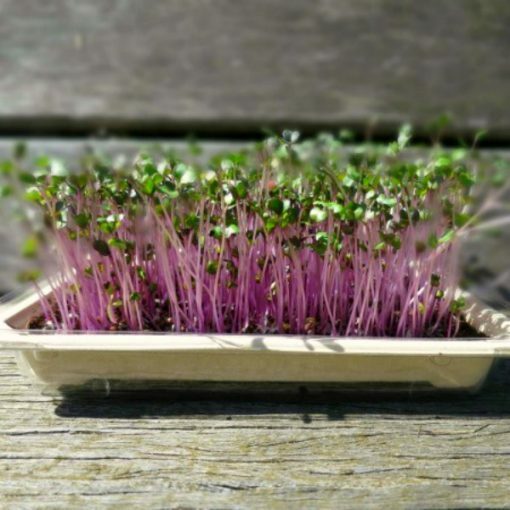 This microgreen kit is an awesome way to get started growing food with kids. Why? Because they are fast growing, little like them, and if you are short on space, they are compact and super easy to look after. This means kids are more likely to not only look after them during the growing process but eat them as well! The perfect sized growing trays are included in this microgreen kit. They can be simply placed on a windowsill or kitchen bench. Growing microgreens at a pre-school or primary school is also an excellent way for kids to learn about the seed life cycle. Growing food is so important for our future. All inside a reusable drawstring bag! Customers can also access an amazing selection of microgreen seeds available for you to choose in your kit. These seeds are also available to purchase individually. CLICK HERE. Microgreens are little edible plants bursting with flavour and nutrition grown from the seeds of vegetables and herbs. Comparing their size, they are older than a sprout (root, seed and shoot) but younger than a full-grown plant. They are grown from the same seeds as you would grow a full-sized vegetable, however, when planting microgreens you plant a lot more seeds and pack them closely together. Therefore at such a young age, the plants are highly concentrated in nutrients so you get more bang for your buck!